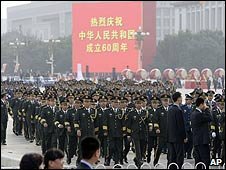 China has been staging mass celebrations to mark 60 years since the Communist Party came to power. The day started with vast lines of tanks, soldiers and missile launchers parading through the capital Beijing. 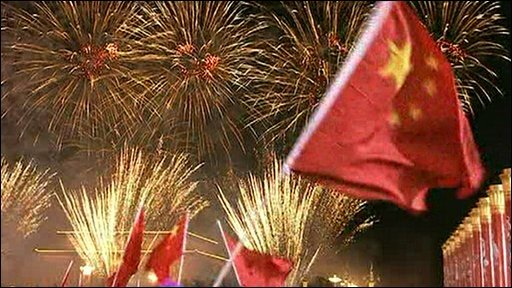 Later, in Tiananmen Square, there was a spectacular fireworks show and a concert of patriotic songs and dancing. However in Nepal, police detained more than 70 Tibetan exiles who marked the day with a protest against Chinese rule in Tibet. National Day is an annual highlight for the Chinese government, but extra effort has been made to mark the 60th anniversary. Celebrations began in the morning, with troops firing cannons and raising the red national flag, while President Hu Jintao, wearing a black Mao Zedong-style tunic, looked on. He was joined by his predecessor Jiang Zemin, Premier Wen Jiabao and other senior leaders. Mr Hu, speaking from the same spot where Mao had stood 60 years ago to formally proclaim the founding of the People's Republic of China, claimed his country had a bright future. "Today a socialist China that faces the future is standing tall and firm in the East," he declared. "The development and progress of the new China over the past 60 years fully proved that only socialism can save China, and only reform and opening up can ensure the development of China," Mr Hu told the crowd. After his speech, there was a two-hour parade of 8,000 soldiers, tanks and missiles - including long-range nuclear missiles and other home-grown weapons. The military show was followed by a colourful parade, with singers and dancers in elaborate costumes moving in exact unison, reminiscent of the Olympic opening ceremony last year. National sports hero Liu Xiang and taikonaut Zhai Zhigang, as well as other Chinese celebrities, rode through the crowds on brightly decorated floats. 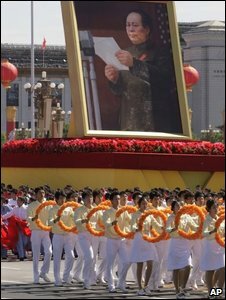 Giant portraits of all China's communist leaders were paraded through the square. Even the weather co-operated with the celebrations; cloud-seeding the day before brought overnight showers to disperse the smog and bring in clear skies. Some 30,000 people were invited to watch the events, but others were encouraged to stay at home and watch the festivities on TV to "avoid complications". Security was tight, and armed police in body armour were at major road junctions in the capital, with snipers spotted on buildings along the parade route on Chang'an Avenue. Roads were blocked off, the international airport closed and the subway disrupted.